A direct preaching is hard to understand: it opens up in all directions. I beseech you, do not intend to speak too clearly. If you speak clearly, it is harder to get out of it. If you don’t believe it, I will try to raise the case, look! A monk asked Master Yuezhou Qianfeng in all earnestness, "In a sutra it says, 'Ten-direction Bhagavats, one Way to the gate of nirvana.' I wonder where the Way is." Yuezhou lifted up his stick, drew a line and said, "Here it is." Later a monk asked Yunmen to give instruction about this. Yunmen held up his fan and said, "This fan jumps up to the heaven of the thirty-three devas and adheres to the nose of the deva Taishaku. When a carp in the eastern sea is struck with a stick, it rains torrents as though a tray of water is overturned. Do you understand? Do you understand?" I.e., the Buddha. "The blessed ones of the ten directions" (Cleary). "deity Sakradevendra" (Aitken); "the chief of the celestial rulers" (Cleary); "Deity Saka Dvanam Indra" (Low, Sekida); "the presiding deity" (Senzaki). Or "It is like the dragon carp of the Eastern Sea, tipping over a rain cloud with its tail." (Senzaki)  This last line is only in the BOS version. For a swift horse there's nothing like a hole to slow it up. I believe a half for now. If you doubt, seek elsewhere. Please speak in our language. [6-7] When you understand this way, it's even harder to understand. One goes to the bottom of the deepest sea, heaving sand and raising dust. The other stands on the top of the highest mountain and causes white waves to billow up to the sky. so each of them extends a single hand and together they support the essential principle. It is just like two running boys colliding. In this world there will be no one who has realized the truth completely. Examining with the true eye, I find that neither of the old masters knows where the Way is. "Yuezhou and Yunmen are like riders, neither of whom can pass the other" (Senzaki). before your tongue has moved, the teisho is finished. "Even if you keep on top of the situation with every move /Still you should know there's an opening higher beyond" (Cleary); "Though each move is ahead of the next, /There is still a transcendent secret" (Low, Sekida); "More than brilliant intuition is needed /To find the origin of the right Path" (Senzaki); "Even if at each step you may be ahead of him, /Know there is still another way up" (Shibayama). "Though you may take the initiative, point by point /You must know there is still the all-surpassing hole" (Yamada); "...there is still the all-surpassing breakthrough" (Sato). Taken in hand, even a dead horse is cured. Vivifying incense intends to heal your deathly illness. The reviving incense is about to cause you peril. At my house, eyebrows are not begrudged. Only then will you believe he didn't spare his eyebrows. There are no walls in the ten directions -- from the very beginning there is fundamentally no obstruction. There are no doors in the four quarters -- just right here is the entry way." The monks question comes from the fifth part of the Heroic March Scripture: the Blessed Ones of the ten directions are on one road, the gate of nirvana -- where is the entrance to the road? To interpret the meaning of this, according to the scripture, the Realized one is speaking on his own, to prepare the ground for 'complete pervasion.' Because (as Hongzhi said), "right here is the entry," Yuezhou drew a line with his staff and said, "Here it is." Those who don't know say Yuezhou was pointing out the road to his monk; or that he delineated it for the monk and didn't go anywhere else. It is definitely not these principles. Yunmen explained it so profusel! 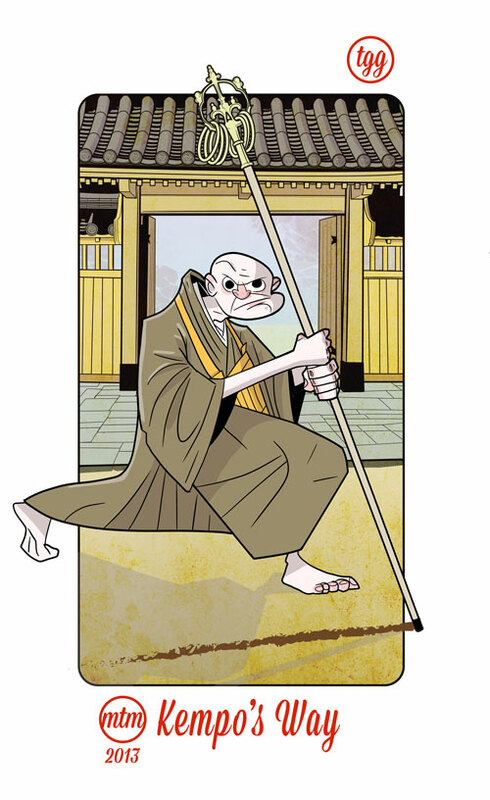 Yuezhou temporarily points out the road, indirectly helping beginners; Yunmen then went through his transformation, so to make people of later times be unwearied. Yunmen, stop with the curios! Whacks Indra on the nose. Yunmen studied with Yuezhou before he succeeded to Xuefeng's Dharma. When Yunmen met Yuezhou, Yuezhou said, "In the dharmakaya, there are many barriers. You must penetrate them one by one, before you can return to your home and sit solidly. Then you must know that there is yet more pivotal realization." As Yamada Roshi said, "When your mind is crystal clear like a still mountain lake, then anything will do as a medium of enlightenment." Anything can turn out to be the correct way. But Yuezhou came forth from that calm and presented it. He drew a line in the air, saying, "Here it is!" The thrush singing in the early morning would answer the monk's question just as well. Yuezhou put himself forward -- he showed his holy mind -- and this is what we all must do. He came forth with stick in hand as we come forth with pick, hammer, ketle, pen, or calculator in hand. This is the vital act of responsibility. This is the basic point of work -- of sweeping the garden, striking the bell, washing the pots after breakfast. Lifting his fan instead of his staff, Yunmen evokes the richness of Indian cosmology. All the holy ones throughout space and time, are included in the perfected wisdom of one moment, as Yunmen lifts his fan. For cosmic wit, nobody beats Yunmen. Carp takes a blow, and rain comes down. Wonderful. When our big bell rings, our neighbor looks up. You don't need Sakradevendra up there to turn the Dharma Wheel. What greater miracle can there be? Yuezhou showed how the step-by-step road to nirvana is a single gesture. Yunmen went to nirvana and poked the loftiest deity in the nose with his fan. These two old worthies, Yuezhou and Yunmen, joined hands to show how "eternity is in love with the productions of time" -- how this gesture of this moment includes heaven and earth, past, present, and future. And that is our purpose too, our practice, and our realization. But one of them was most sharply focused. Both Yuezhou and Yunmen are responding is as straightforward a manner as they know how. Zen masters are not trying to be obscure. Throughout everywhere. Everywhere you look are Buddhas. Everywhere you look are saviors. You are already whole and complete, you are fully awakened. Yet one Way only lies open to Nirvana It is no the way of Zen or Sufism, or the inner glance or anything else like this. So what is it? Where did Yuezhou draw the line? Not on empty space, or nowhere. In Zen it is said, "It is right before your face." But don't let us be content with this reply. Ask again, where did Yuezhou draw the line? With Yunmen, the highest of all possible heavens is within reach of his fan; with just one flick it hits the nose of the deity there. Action, action, action, pure dynamic action. Limits are lost in the one Way. Yuezhou has the essence, Yunmen the function, both have the one Way. So now, what is the one Way to what you already are? Buddhas (Bhagavats) are found everywhere (in the ten directions). There is nothing but Buddhas. A broad, level highway leads to Nirvana. The monk is quoting from the Surangama Sutra. "Swayed by words, one is lost; /Blocked by phrases, one is bewildered" (Wumen's verse, GG37). This monk was trying to find truth in the lines of the sutra, and was blocked and bewildered by them. Words and phrases are not to blame. But first you must practice; then you will find that words and phrases are very helpful. Yuezhou drew a line in the air, or perhaps on the ground. Anyway, he showed that the road was not far away but here before the monk. Yuezhou used his staff, Yunmen his fan. Both used the article at hand as an immediate and spontaneous symbol of Bhagavat, Nirvana, and the road. Yuezhou's illustration was simple, but Yunmen's was elaborate. The thirty-third heaven is the highest part of the universe, and the deity Sakra Devanam Indra resides there. Yunmen's fan performed a conspicuous action in striking the supreme deity. But these words of Yunmen's are a little more elaborate than his usual acute, pity utterances. He must have been in a relaxed mood, in a state of playful samadhi. The carp of the eastern sea is also a mysterious being. When the time comes, it becomes a dragon and ascends to heaven, accompanied by a stormy wind and black clouds of torrential rain. This is a metaphorical description of a monk's attaining enlightenment. Bodhidharma did not come to China. Zen is not a matter of coming and going. Truth is in front of your nose. The walking stick had nothing to do with it, after all. The figure "one" is even a nuisance. Look! I say. Here it is. [5-6] Poor monk! I do not htink that even then he realized the entrance to the Path. The poor devil was certainly "up against it"; thereore, he asked for a loan. Yunmen tinkled the gold pieces in his pocket, but had no wish to give a loan. If I had been the monk, I would have covered my nose with my hand and said, "Master, you hit me too hard. Please tell your fish to behave in the monastery." Not only Yuezhou and Yunmen, but also Wumen himself does not know where the Path starts. Buddha Shakyamuni and Bodhidharma do not know the Path; if they did, they would be neither Buddha nor Patriarch. The student has to study the question thoroughly before worrying about its answer. Where is the one way? This koan is unique in illustrating that the answer is to be grasped in the question itself. If Buddhas are in all the ten directions, can there be any spot where Buddha is not? If one has tryly cast himself away, everything, everywhere, is in the blessing of Buddha. There can be no place where Buddha light does not reach. The "one way" is then the absolute, transcendental One Way for which there is no far and near, wide and narrow, coming and going. This monk is standing in front of the White House asking where the capital is. What you see, what you hear, where you stand, where you sit, is nothing but "it," the One Way. [5-6] What big talk! What an eccentric remark! No common-sense interpretation is possible here. The one who lives the fact of "the Bhagavats of the ten directions" is given a new life as the wonderful working of no-mind develops, and a completely new vist is opened up to him. If I call this working "the wonderful working of no-mind," such naming has already marred "it." The One Way of Zen has to be grasped by each one of you as your own. There are at least three interpretations: (1) all Buddhas in the whole universe have only one Way to get to nirvana; (2) all things are none other than Buddhas; for all of them there is only on Way to nirvana; (3) everything is Buddha, everywhere is the one straight Way to nirvana. The second is deeper than the first; the third deeper than the second. The Way is not only where Yuezhou drew the line but everywhere in all ten directions. When you stand up, it's there. When you sit down, it's there. When you feel hungry, it's there. When you are happy, it's there. No matter how long you search or where you may go to look for it, you will never find anything that can be called the Way. It is a roadless road. [5-6] Just try to fathom what the carp and fan mean. If you have attained true self-realization, it will all be ery clear to you, and you will meet and recognize Yunmen face-to-face. 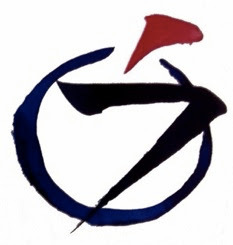 Both Yuezhou and Yunmen are presenting the essential world and the phenomenal world simultaneously, and they are equally matched in their skill as Zen masters. The challenge for each of us is to reveal this one road. Yuezhou says, "Here it is!" He snatches away everything, and Yunmen gives it back. If all expressions were the same, we would all be bogged down. Sometimes we have to hear things with different ears or see things with different eyes in order to perceive them. Yunmen was probably holding a fan at the time he said this. Can you reveal the road he's referring to as the one road to the nirvana gate? The thirty-third heaven is right here. Indra is right here. Yunmen's fan is right here. Watch out or you will get whacked on the nose. A carp is a sacred animal that, according to legend, can jump up and and transform into a dragon. It's clubbed once and it rains like cats and dogs. The carp is riht here. When you are whacked between the eyes, the water starts flowing. Yuezhou is gathering it in and Yunmen is spreading it out. What are you adding to the practice that's extra? Right here is one road. Right here is the one life. Where else could it be? Thus the master may then ask, "where is the road to Buddha?" The pupil's response is to slap his master once. When the master follows up, "'Buddha' -- what's it mean?" the pupil surveys his surroundings and says, "The realm of Buddha." Yuezhou and Yunmen's sayings suggest the rejection of the other-worldly approach to "enlightenment." The question "where is enlightenment?" should not be answered in the first place (the pupil slapping his master), but if answered -- anything is as good as another. In this "Buddha-world" there are no two things that are not related to each other ("strike the carp of the eastern sea and rain will come down"); you may draw a line in the air or throw up your fan -- there is enlightenment. and you know Yunmen’s dumb and Yuezhou’s without eyes. there's nothing left to transform. The old car needs oil. The one Way to the gate of nirvana. Organisms millions of years ago. To pay a few dollars.